at The Invisible Dog Art Center! 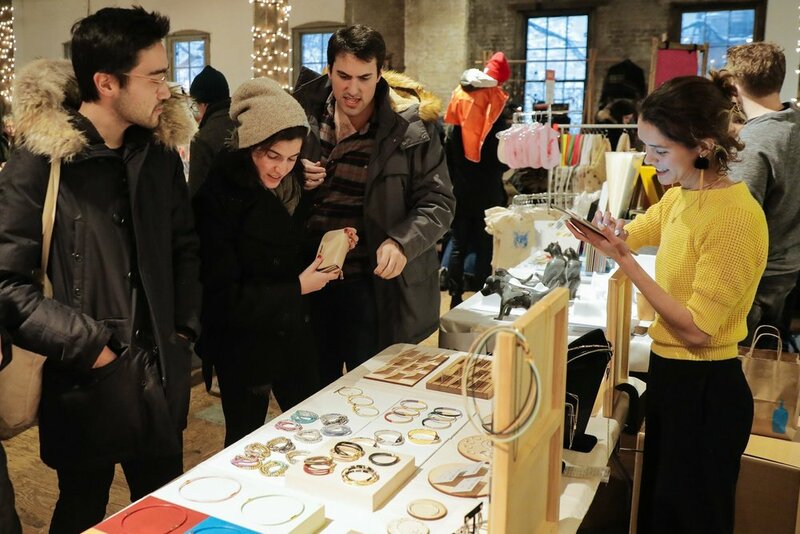 Thank you for your interest in becoming a participant and joining the FAD MARKET community of artists, designers, vintage, market and flea enthusiasts. We are here to help you promote your work and strengthen your brand as well as offer a unique and conveniently located venue. Spaces at our indoor market at City Point are 6' x 5' and cost $260/weekend and $150/day. For table shares (3' x 5'), $150/weekend. Please note: We do not take one-day table shares unless you join with a friend that is approved by our vetting committee. If approved, the cost is $100/each for the day. Priority is given to two-day applicants. Tables and chairs are available for rent at an additional cost. Table (6' x 30") - $20. Table (4' x 30") - $15. Please note: If you are bringing a rolling rack and requesting a 6’ x 5’ space, you must rent or bring a table that is 4’ x 30” or smaller. If you want to use a 6’ x 30” table and a rolling rack, you must pay an additional $20 for the space needed for the rolling rack when placed perpendicular to the table. If you are table sharing and bringing a rack, you will need to pay $20 for the space needed for the rolling rack when placed perpendicular to the table. Please select your available days and we will notify you with the first available. For this market, please note that only a handful of booths are allocated for table shares and not guaranteed. If you are selected into the market and there are no table shares remaining, you will be automatically assigned a full booth unless you check below that you are not interested in this option. Please select what best describes your display setup. We will try our best to accommodate your requests. Please note if you are bringing a rolling rack and requesting a 6’ x 5’ space, you must rent or bring a table that is 4’ x 30” or smaller. If you want to use a 6’ x 30” table and a rolling rack, you must pay an additional $20 for the space needed for the rolling rack when placed perpendicular to the table. If you are table sharing and bringing a rack, you will need to pay $20 for the space needed for the rolling rack when placed perpendicular to the table. Access to electricity is extremely limited. We will try our best to accommodate you. Please note that supply is not guaranteed and if provided, there is an additional $10 fee. Participants are responsible for providing their own extension cords. We have allocated a handful of tables in the front section, which you can reserve for $20. This section is called Prime. We have also allocated a handful of tables in the front to mid-section, called Center, which you can reserve for $10. This is subject to availability and approval. By clicking I agree, you, the vendor, acknowledges that s/he has read the FAD Market term and conditions (found by clicking the link below), agreeing to be bound by such agreement and rules in the event that vendor accepts an offer from FAD Market to participate in the market. The agreement and terms and conditions shall become binding upon the parties only upon (1) FAD Market sending you an offer e-mail and (2) your acceptance of the FAD Market offer by paying the space rental fee and FAD Market's confirmation of receipt of your payment in accordance with the terms and conditions and the offer e-mail. Thank you for your application to FAD Market's NYCxDESIGN Market at The Invisible Dog Art Center. Please note that the application deadline is March 19. We will be in touch on or before April 9 with a status on your application. In the meantime, please visit the FAQ page on our website for more information. If there are changes in your schedule and you would like to withdraw your application, please send us an email to let us know as soon as possible. Failure to do so will affect consideration for future applications.